So sorry to hear that you have been and continue to deal with health issues. I’ve put your name on my prayer list and will be praying for you on a daily basis. I wish you a speedy recovery so that you can return to your passion and share it with your followers. God bless and please, when you can, keep in touch. Lots of love. We are blessed to have you share your life and your passion with us. God bless. I was very sorry to hear you have been unwell. You have a wonderful attitude and I feel that is half the battle to getting better. 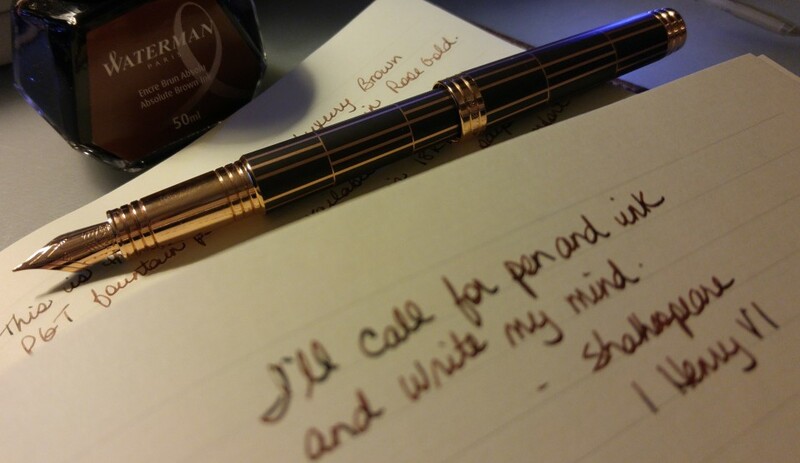 I also received a fountain pen for Christmas and I think of you every time I use it. I love writing with it and I have you to thank for inspiring the gift. I will be thinking of you and wishing you a speedy and full recovery. You will be missed! I want you to know that I am thinking of you with nothing but positive thoughts for your quick recovery. I am so sorry to hear this. I hope you’ll be back on form soon. Like Susan said, you have a great attitude (while someone like me would be sitting around wallowing in self-pity) and that’s going to be a tremendous help. Here’s wishing you all the best. I hope so too Janet, and thank you for your kind words. I can wallow with the best of them, never fear! Take care of yourself. My prayers and love are with you! Thank you for your post. Your health comes first and I send my best wishes for your ongoing treatment. Take care. I agree, rupertarzeian, and it is sometimes hard to put health first. But I’m trying. Thank you for your kind words. So very to sorry to hear of your health issues and ensuing lack of energy, but can sympathise as I, too, go through periods (I write poetry online, etc.) where I am unable to do much of anything. Do know that my thoughts and prayers will be with you for a speedy recovery or at least doable health management that will allow you to continue the pursuits you so love. You will be missed. Thank you Michele, that is so sweet of you. Sounds like you know what I am facing. I hope to be back soon as well. Thank you susan1859 I will do my very best! I’m touched Florence, thank you so much for your kind words. I’m doing my best to get back to normal! So sorry you have been sick, but happy to hear you are making progress. I hope it continues and you are back to all the things you enjoy in life and blogging very soon! I have only just discovered your blog, and only now read this post. My heartfelt best of wishes to you, and I hope you recover enough to take a seat at your desk as soon as you could wish. All the very, very best to you and your family. Thank you Paul I’m feeling better every day. Hope to resume my seat soon! I am very sorry to hear of your illness and wish you a happy and very speedy recovery. I just recently found your blog and was really looking forward to following you. I will keep you bookmarked and will check regulary. My compliments on a wonderful blog and I will add my prayers to the other followers here. Thank you so much Michele, best of luck with your blog. Slow is better than nothing! So pleased to discover your response to my comment since then we were hit by Irma and are in recovery mode. No major damage to us, but power outages and evacuations have made life less than pleasant lately. Praying for all in our country struck by these horrible storms and for you, too. Until next time. Hope to see you blogging again in the near future. Take care. Hi Michele so sorry to hear of your experience with Irma. I hope life is slowly getting back to normal for you, and for all who were affected. I hope to resume blogging before 2018. You take care as well.